Chevrolet created one of the most iconic car brands when they introduced the Chevy Corvette. It has been a consistently popular and sought after vehicle. EZSofttops specializes in offering the original style convertible top, original fabric selection and related convertible top parts. We can help you restore your Corvette convertible to show room condition! 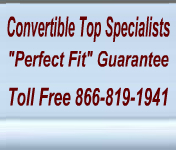 Please enjoy shopping our Corvette convertible tops and related products and if you have questions please do not hesitate to contact our customer service at 866-819-1941.